As we are only doing one league game a month, I will occasionally introduce a pick-up game for our local league play. Of course this game is available to play by any club or franchise associated with the National Dog Agility League. Though results will not apply to the League underway, dogs still earn Lifetime Performance Points (LPP). 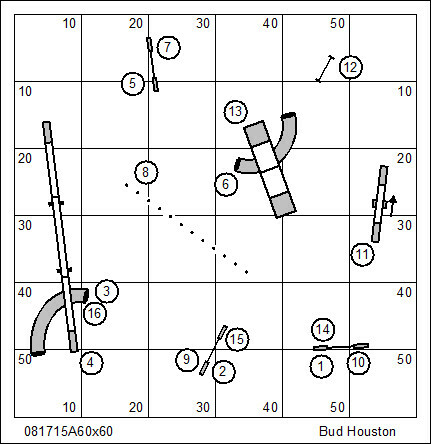 This is a numbered course that will be scored Time, Plus Faults. The League has focused on and even specialized in International level skills and challenges. These days aside from the USDAA’s Masters Challenge class (and I suppose the new AKC class) we don’t really have the opportunity to hone skills that are common in Europe and are very likely to be featured when we send our World Team to Europe. What might have been considered ugly or unsafe only a few years ago is fodder for the central challenge in the International-style course. The problem with a score of “E” is that it cuts off any hope of measuring performance or, for that matter, comparing scores. As the National Dog Agility League (NDAL) is not primarily a titling agility registry we require a system that allows a comparison of scores. Purists in the sport will spit and sputter in objection to a dog earning only 5 faults for a wrong course. But if you think about it, those 5 faults will move the dog down in the standings without actually removing the performance score as though it never existed. I know this is short notice. On Tuesday, August 25 I will be in Latrobe to do a distance clinic and introduce the National Dog Agility League to agility fans at B&D Creekside. You should contact Darlene (arcmasterdarlene@comcast.net) if you’d like to come out to play with us. It will run from 6:30 to about 9:00 and should be priced very inexpensively. We have only a few league teams so far, around the U.S. and also with clubs in Canada and Mexico. League scores are derived from the top 5 performing dogs at each club or franchise. So clearly it gives an advantage to a club to run league with a large number of dogs. I have an ulterior motive in helping to establish league play in Latrobe. I want to create a coalition of clubs in the Ohio valley that will get together for an annual championship tournament that owes no affiliation to any big agility organization. They have such a tournament in Florida. Every club sends teams of nine dogs & handlers broken up into 3‑Beginner; 3-Intermediate; and 3-Masters. The winning “team” is the aggregate score. Here’s hoping you’ll join us on the 25th! You are currently browsing the archives for the B&D Creekside category.